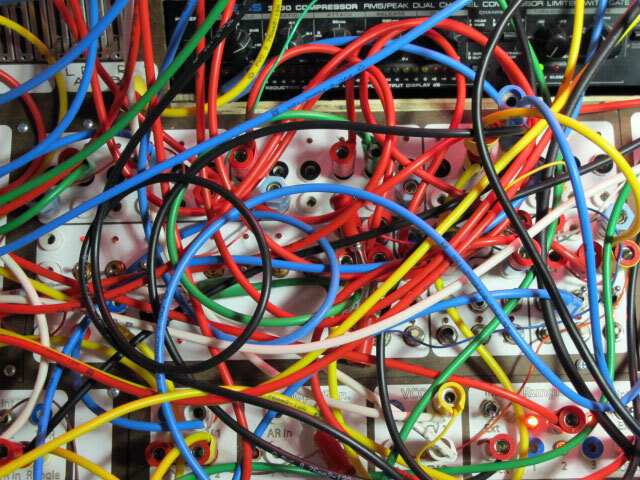 I met with artist, musician, educator and circuit-bending guru Pete Edwards last week, as he was preparing for his exhibition “Specter Flux” at Long Island City’s Flux Factory, where he is currently an artist in residence. The show opens on June 30th and will run until July 3rd. 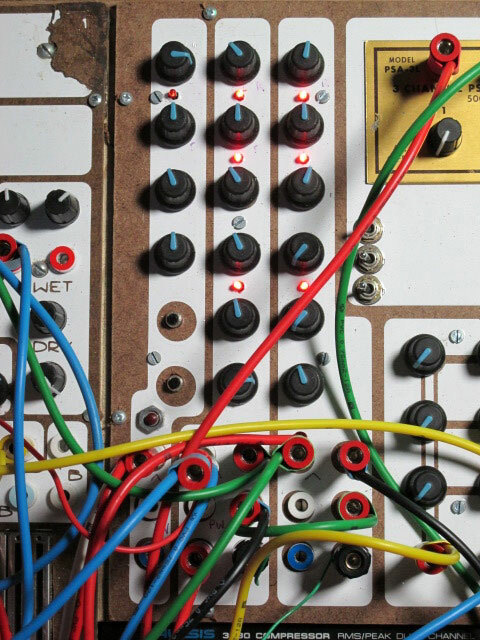 Since 2000, Pete has sold his handmade electronic instruments through his company Casperelectronics, and performed with his creations under the same name. 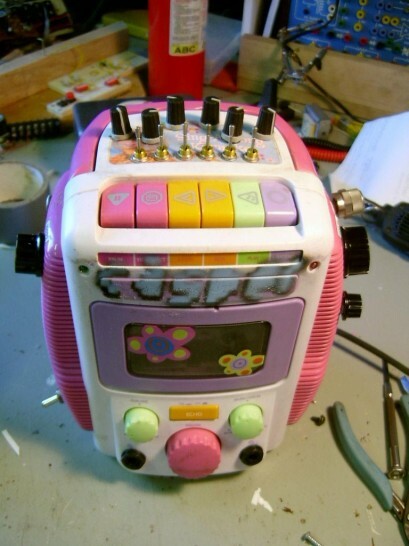 Over the span of his career, he’s created unique and special instruments out of a variety of unusual items, such as a Jack-In-The-Box Toy, an Amazing Ally doll, megaphones, and a BarbieKaraoke Machine. His work on Casio SK-1s and Speak&Spells; have been an inspiration for many in the world of circuit-bending, and no doubt his output has helped popularize these objects as ideal for these sorts of projects. 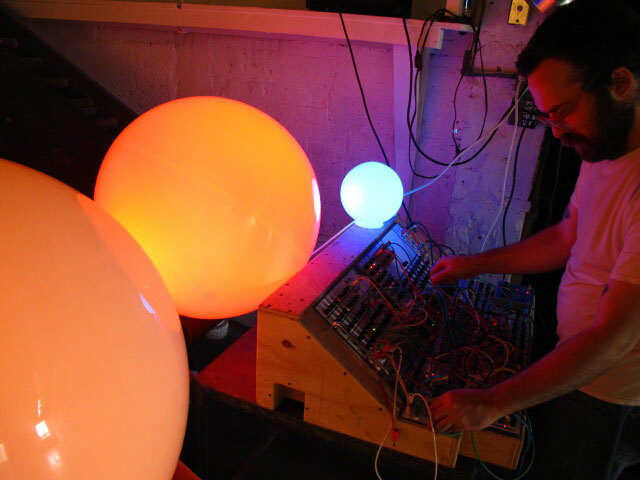 More recently, Pete has begun incorporating plastic orbs into his practice, producing them as standalone interactive, color-mixing lights or as components to his machines. These orbs will be central to his installation at Flux Factory, and he showed me a few of them during my visit, as well as a nifty analog synth he built from scratch. Both will be used in “Specter Flux”. Pete mentioned that he enjoys the mesmerizing quality of the orbs, and the fact that they immediately captivate an audience, regardless of context. Each orb is individually tuned to respond to volume and tone, so that viewers must play with them in order to gauge their sensitivity. The orbs were installed in an elevator at the Tang Museum last year, and Pete recalled, with delight, that despite the seeming privacy of the elevator, that the sounds of visitors clapping, singing and yelling at the orbs travelled throughout the building. 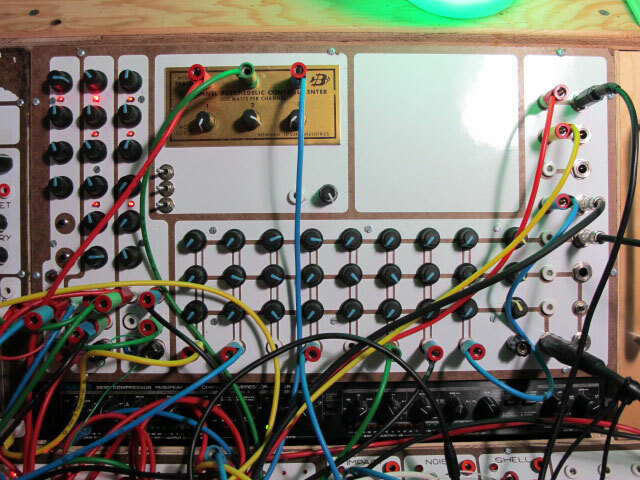 The functionality of the orbs are based on technology designed by Chris Scully, who is a partner in Pete’s DIY electronic kit business Ghost Wizard Design. A microphone and a microcontroller track the volume and frequency of the surrounding sound, which then triggers light intensity and color. The lights themselves are red, green, and blue LEDs, which blend together to create a range of colors. 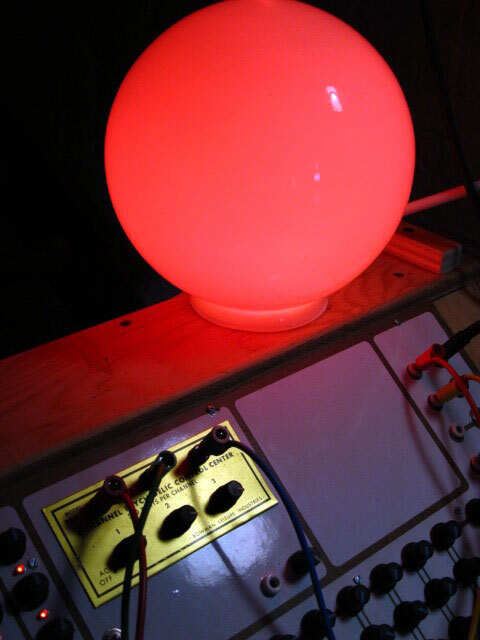 An orb also sits atop Pete’s homemade analog synth, and it is controlled by a panel on the console. Pete cleverly took the metal plaque from a 1970s light machine known as the “3 Channel Psychedelic Control Center” and reused it for the orb’s panel. Orb and the "3 Channel Psychedelic Control Center"
The orb on the synth responds to pulse wave modulation emanating from signals generated by the synth, syncing light and sound. Pete walked me through some of the other features of this complex instrument, which he built with help from Brendan Gaffney, a student at Skidmore College. 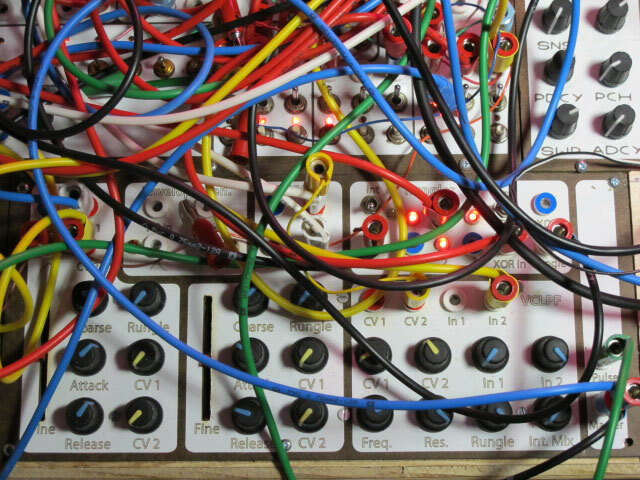 Like all modular systems, the instrument is made up of blocks of an array of different tools. Pete said that the instrument is one of his most intricate and ambitious projects, and therefore, it would take hours for him explain each and every detail. Here’s a quick tour of some of its key features. On the top left hand side of the console, Pete has installed a bunch of sound generators, processors, and control modulators. They make, modify and control sound. Specifically, there are 6 VCOs, 5 voltage controlled filters, and a whole lot of mixers. Each mixer is connected to an effect, allowing Pete tremendous control over the suite of effects at his disposal, like pitch shifter echo, sample echos, distortion, etc. On the top right hand side of the console, Pete placed a matrix mixer, which is the master mixer for the entire instrument. There are 8 channels, with 3 controls for each channel, including 2 effects. There is also an option to plug in and run outside sound sources into the machine, such as a tape deck or another instrument. 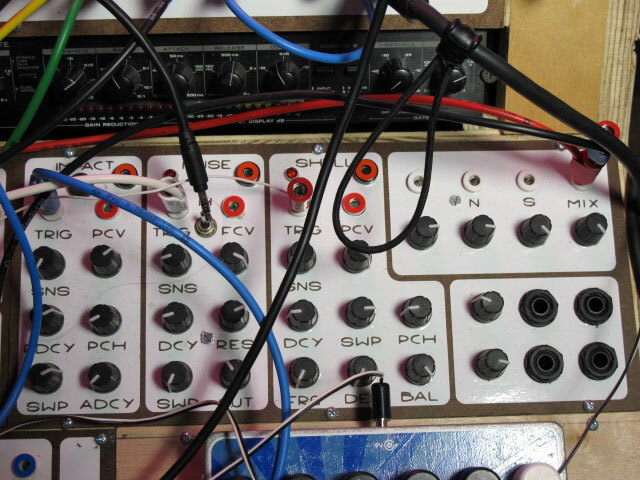 Pete expressed his frustration with the closed, finite nature of many systems, and by allowing the user to plug in other instruments, it makes his instrument more malleable and open to the outside world. Underneath the mixer is a drum sound module, and to the left of it, a rhythm sequencer. Together they operate as a rudimentary drum machine of sorts. 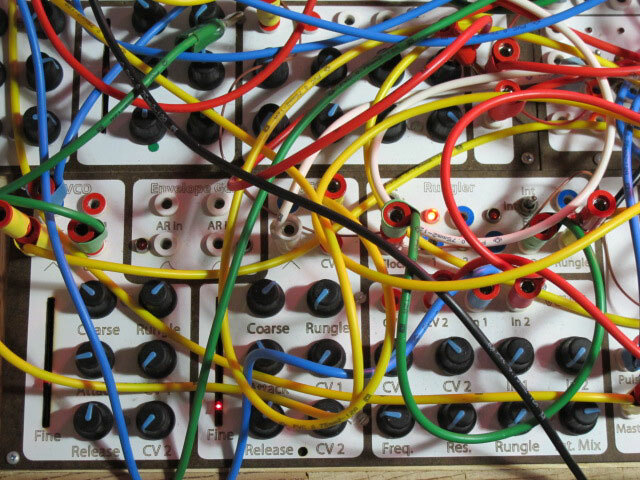 The synth also holds several standalone modules - each containing the basics, like a LFO, filter, and AR envelope. 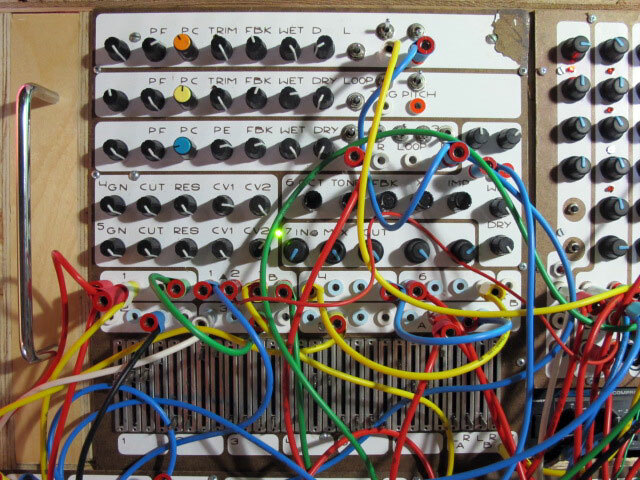 Pete used designs by Rob Hordjik to build the modules, and explained that they use wildly clever feedback-based types of sequences, which was why he was eager to implement them. Lastly, the small band you see here contains microcontroller and conventional LFOs which use a mathematical function to divide up the bass rate, and allow other complex sounds. Pete likened the effect to that found in dub step, lending the instrument to a crunchier sound, with more bass. The complexity of the instrument makes it almost impossible for Pete to repeat the same thing. He described the process of playing and performing with it as a continual learning exercise, where compositions are more akin to “single vignettes” than a routine. 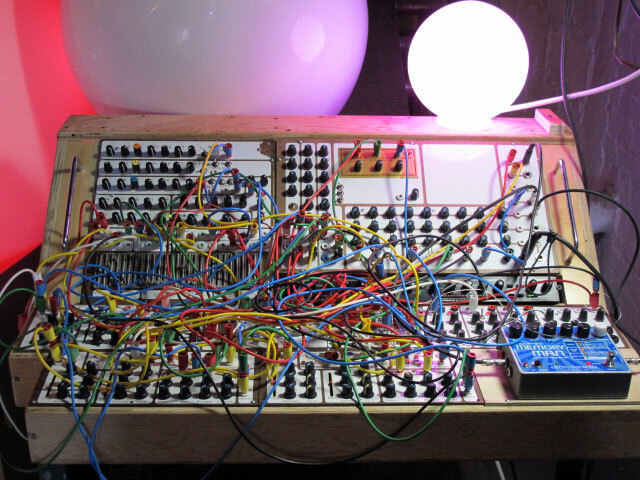 To hear the synth in action and engage with the orbs yourself, visit Flux Factory this weekend!